Holy God, we bless thee for the gift of thy monk and icon writer Andrei Rublev, who, inspired by the Holy Spirit, provided a window into heaven for generations to come, revealing the majesty and mystery of the holy and blessed Trinity; who livest and reignest through ages of ages. Amen. Holy God, we bless you for the gift of your monk and icon writer Andrei Rublev, who, inspired by the Holy Spirit, provided a window into heaven for generations to come, revealing the majesty and mystery of the holy and blessed Trinity; who lives and reigns through ages of ages. Amen. Thei commemoration appears in A Great Cloud of Witnesses. Andrei Rublev, born in the 1360s, died 1427 or January 29, 1430) is considered to be the greatest medieval Russian painter of Orthodox icons and frescoes. There is little information about his life. It is not known where he was born. Andrei Rublev probably lived in the Trinity-St. Sergius Lavra near Moscow under Nikon of Radonezh, who became hegumen after the death of Sergii Radonezhsky (1392). The first mention of Rublev is in 1405 when he decorated icons and frescos for the Cathedral of the Annunciation of the Moscow Kremlin in company with Theophanes the Greek and Prokhor of Gorodets. His name was the last of the list of masters as the junior both by rank and by age. Theophanes was an important Byzantine master who moved to Russia, and is considered to have trained Rublev. Chronicles tell us that in 1408 he painted (together with Daniil Cherni) the Assumption Cathedral in Vladimir and in 1425–1427 the Cathedral of St. Trinity in the Trinity-St. Sergius Lavra. After Daniil's death Andrei came to Moscow's Andronikov Monastery where he painted his last work, the frescoes of the Savior Cathedral. He is also believed to have painted at least one of the miniatures in the Khitrovo Gospels. Rublev's famous icon of the Trinity. The only work authenticated as entirely his is the icon of the Trinity, ca. 1410, currently in the Tretyakov Gallery, Moscow. It is based upon an earlier icon known as the "Hospitality of Abraham" (illustrating Genesis 18). Rublev removed the figures of Abraham and Sarah from the scene, and through a subtle use of composition and symbolism changed the subject to focus on the Mystery of the Trinity. In Rublev's art, two traditions are combined: the highest asceticism and the classic harmony of Byzantine mannerism. The characters of his paintings are always peaceful and calm. After some time his art came to be perceived as the ideal of Church painting and of Orthodox iconography. 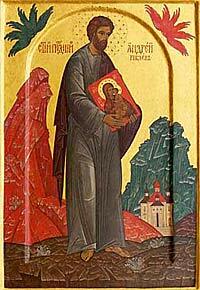 Andrei died at Andronikov Monastery on January 29, 1430 (this date is still questionable). He was canonized a saint in 1988 by the Russian Orthodox Church. The church celebrates his feast day on January 29 and July 4. Since 1959 the Andrei Rublev Museum has been open at the Andronnikov Monastery, displaying the art of his works and his epoch. In 1966, Andrei Tarkovsky made his celebrated film, Andrei Rublev loosely based on the artist's life, which shows him as "a world-historic figure" and "Christianity as an axiom of Russia's historical identity" during a turbulent period in the history of Russia.